NuMedica D3 2000/5000 is a soy-free, bio-identical supplement for bone health and immune system support. This product has no gluten or allergens and provides professional-grade vitamin D without fillers. Instead, NuMedica D3 2000/5000 contains the vitamin D you need to support optimum health along with rice bran oil, gelatin, and glycerine. This formula stands out from the competition with its simplicity and is highly effective for fulfilling your vitamin D requirements. Vitamin D is the one vitamin that our bodies can make given enough sunshine. Unfortunately, research suggests that most people don't produce the vitamin D needed to support optimum health. A natural supplement like NuMedica D3 2000/5000, on the other hand, ensures that you are getting the amount of vitamin D you need to support strong bones and immune system health two areas of your body that depend on a regular supply of vitamin D. Vitamin D is unique because it is regarded as both a vitamin and a hormone. Without vitamin D, our bodies cannot absorb the calcium needed to support things like bone health. 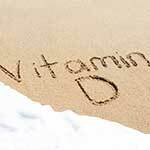 As a vital nutrient, vitamin D's contribution to overall good health cannot be overestimated. NuMedica D3 2000/5000 contains the natural vitamin D3, which is four times stronger than the synthetic vitamin D2. 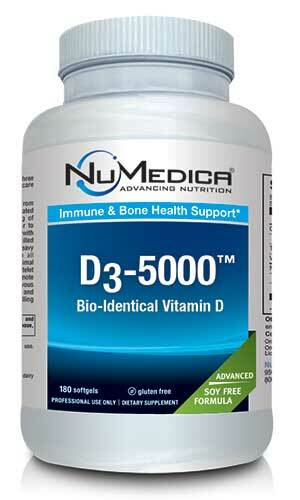 Vitamin D3 allows works with calcium to ensure strong bones, an important benefit, particularly as we age. Studies suggest that vitamin D is involved with roughly 2,000 genes in our bodies, making it integral to good health in a variety of ways. Aside from supporting your bone health and immune system function, vitamin D is thought to help reduce risks for heart disease and possibly even multiple sclerosis. Moreover, vitamin D can enhance your teeth to ensure you maintain your healthy smile. D3-5000 IU 90 Softgel 1 Softgel 90 Take one softgel daily or as directed by your healthcare practitioner. D3-5000 IU 180 Softgel 1 Softgel 180 Take one softgel daily or as directed by your healthcare practitioner. Other Ingredients: Safflower oil, extra virgin olive oil, gelatin (bovine), glycerin, water. Provides 1,000 IU per gummy of a proprietary, plant-derived form of D3 in three delicious flavors suitable for vegans. A natural, soy-free, 2000 IU of bio-identical vitamin D supplement that supports overall bone health and the immune system.